Here's my P1903 with a damn near perfect blade. Yes, an excellent example. Now that's what I would call "Mint UnCirculated" condition (just like the coins).! Also with the correct (and matching date) Pattern 1903 Scabbard, Land, Mark I which is always very nice to see. Lovely P1903 5thBatt - its in superb condition and lovely scabbard too. The rifle looks to be in wonderful condition as well. And S>S I'll try to pop up more photos soon, I seem to be stuck working 14 hour days at the moment so a little pressed for time. Seems odd that my 1903 has regimental markings (so clearly issued) but no govt acceptance arrow. I guess the rules were there to be broken. Seems odd that my 1903 has regimental markings (so clearly issued) but no govt acceptance arrow. I guess the rules were there to be broken. Not that strange when you consider the bayonet is a conversion from an original P'88 blade. So the blade is P1888 while the pommel is P1903. Around the time of the Boer War many P'88 blades were produced which were not procured by the War Department via official Gov't contracts. These were made by the trade for sale to allcomers, some of which were the privately raised "Volunteer" regiments buying their own equipment. So those blades purchased outside of an official contract never received any official acceptance, therefore no Royal cypher / acceptance marks. 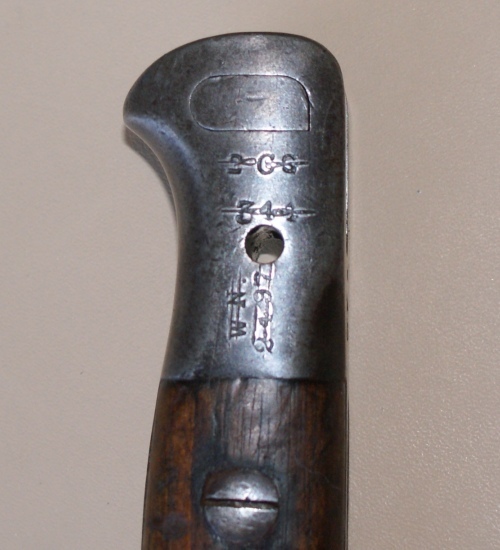 Later when the P1903 version was introduced, many of these 'cleanskin' blades would have been taken out of stores for conversion into the P'03. As I said I'd like to see the other ricasso of yours, but from what you say I gather this is the case with your bayonet, and it is a P1888 conversion. Thanks, I see what youre saying and suspect that you are correct. I'll put up some photos soon. In the meantime I have also been checking through some of mine to see if I have anything similar, as in conversion of a late dated P'88. That bayonet does look quite similar actually. And a coldstream guards regimental marking is always a nice one to have! And a coldstream guards regimental marking is always a nice one to have! When you consider the quite short time frame of usage in service for the Pattern '03 bayonet, this one has done more than it's fair share I believe. The markings on the ricasso show 2 separate reissues in '06 and '07, while the pommel has a cancelled regimental and possibly a service serial.? I posted this previously and we determined that the WN and 2497 could relate to a man's initials and service number, but thats open to speculation. The 2CG is more easily identified (2nd Bn Coldstream Guards) but the fact it has also been cancelled suggests it went around again during the war. Even though it is quite battered and well used, this example is still a favourite of mine for its history and strong claims as an actual veteran of the war. Very interesting. Is there any precedent for marking a bayonet like this? It does seem to be a bit of a coincidence if the initials and service number matches. I wonder if certain regiments took a different approach to their regimental markings - for example some regimental markings seem to be almost common (I quite regularly see bayonets market to gloucestershire and yorkshire battalions) but there are other regiments for which I have never seen a marking - including Notts & Derby. Hard to say what the explanation for this really is. This man in question was a pre-war Territorial and I wonder if they were allocated their own take-home kit. Hence the initials to show ownership and prevent it from going astray. It would have been against regulations I'm sure, perhaps explaining the cancelling out. Another alternative line of reasoning is that the markings indicate a Junior Division OTC such as Wellington College (WN.) but why such a large rack number.? And why would those marks need to be cancelled out. OTC markings are usually the last ones added, unless it happened to be requisitioned back into service.? Interesting. The first explanation does sound the more likely but I guess its very hard to prove either way. Given the initials and service number match this should durely give some weight to the first proposition? I always try to keep an open mind with these things, and work through all the possibilities. It's an intriguing subject somewhat like a puzzle that needs to be solved.! This discussion has brought it back to mind, so I did a little more research (which always produces more ideas) into the Wellington colleges & schools period OTC's. Seems there were a few Wellington OTC's that were very active in that pre-war period. Wellington College, Berkshire (& Salop) and the Wellington School, Somerset. Which then requires an explanation for such a large number below the mark. Another brainwave I had is that the bayonet was matched to a period SMLE rifle's serial. Those serial numbers would have commonly been of 4 digits at that time so perhaps that is it. Matching a bayonet to a certain rifle in an armoury sounds a good idea. And then these marks being cancelled out when the weapons were requisitioned back into service upon mobilisation when there was a definite shortage of weaponry. It would not be unheard of for the OTC's to supply whatever rifles they had to support the war effort. They certainly supplied a lot of young men to the Officer's ranks. Yes Trajan, many of the 'Indian pattern' scabbards can be found with these leather loops attached to the back of the frog and towards the bottom near the chape. Likewise some can be missing them but you can see where they have been once attached. I don't know when this was done as none that I have seen are dated. For general information re: the dating of these scabbards with helve-carrier loops, I will summarise (and slightly modify) what I posted on another thread, post 20 on: http://1914-1918.invisionzone.com/forums/index.php?showtopic=186439#entry2143773, and which, may have been missed by some. "... I have an 11/04 Enfield 1903 with land Pattern scabbard with the loop marked for the 1/5 HANTS... As I understood it when first reporting ... on GWF, this is a regular Indian pattern scabbard, loops top and bottom to take straps for the helve carrier... (T)he 1/5th Battalion Hampshire Regiment was raised August 1914 in Southampton, sailed for India 9 October 1914, landing at Karachi 11 November 1914, and stayed there for the rest of the war until May 1919, when it was at Kohat for service in Third Afghan War, but withdrawn 8 June, arriving back Southampton in November, when demobilised. I was given to understand that the bayonet and scabbard had come back from Afghanistan, but either way, there can be no doubt about Indian service only for the 1/5 Hants, the unit that employed this scabbard." And so in this case the helve carrier loops should, I suppose, date to between 1914-1919 but I stand to be corrected! On that same thread, I post (no 21) a 1941 dated and 'W C C' marked Land Pattern scabbard, which is either re-furbished (it has some newer but 'period' stitching), or newly made (it doesn't seem to be a SA one), and which I would appreciate informative comments on. One of our "resident experts", e.g., SS in Australia, should be able to deal with this better than I, who at best can only make an effort! But is certainly a fun lot of markings! OK. to this frog. I am surprised SS hasn't chipped in yet ("Wakey-wakey!") but yes this looks to be the so-called 'Indian model", with loops top amd bottom for the helve strap. The markings on the top part of the frog, the belt loop part (stamp A), certainly have an 'Indian' look about them. Now to guesses. Stamp C, with its War Department arrow between I an C looks to be an official suppliers and/or inspector's stamp. Can't help with the rest, though. What you need, probably, is: 12 inches of imperial steel in the service of the Raj : sword bayonets pattern 1888 and 1903 in Indian service by Michael Rose, Melbourne, 2017. I don't have a copy - the price of sending it to Turkey is more than the book!